My gosh! My first wedding cake. I have waited on this day for a long time. The cake was made with buttercream frosting and fondant accents with enhanced cake mix because of time. I created 2 - 10 inch cakes for the bottom layer and 2 - 6 inch cakes for the top layer. Using the cake wheel really helped in positioning the lines on the cake. The top and bottom borders are buttercream bead borders. You all will never know how I feel regarding the above cake. Wow! You did such a great job!!!!!!!!!!!!!!!! 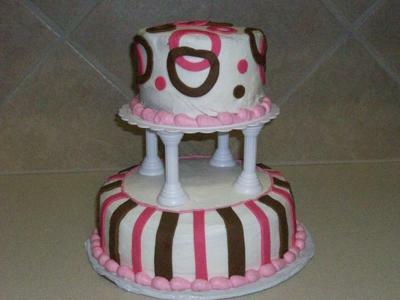 You know, Tx isn't that far from me.....I have 13 months until I make my own wedding cake, maybe you can come help me! Wow! I'm soooooooooo impressed! GREAT JOB!!! EXCELLENT!!!!!!!!!!!! !